Are you finishing a wet basement? A basement waterproofer from Basement Systems, our sister company, should be consulted first. Fill out our Free Estimate form, and we'll put you in touch with your local contractor. One of the most daunting challenges about finishing a basement is managing existing moisture and flooding in the space. If you have a damp or wet basement, then sooner or later, whatever organic materials you store in the space are going to be ruined. Total Basement Finishing can help you plan a finished basement that won't leak and will manage potential floods and humidity. Call or e-mail them today for a free, no-obligation basement design quote! 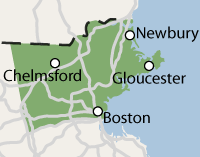 They serve the Massachusetts area, including Revere, Peabody, Medford, Arlington, Salem, Beverly, Methuen and nearby. Even if your basement has never flooded before, the threat of a flood is ever-present in a basement. Groundwater is only half of your problem- there's also a wide variety of potential plumbing failures throughout your home. And when water floods upstairs, it's going to flow downstairs-- right into your finished basement. You can protect your finished basement, starting now. Follow these two simple steps to make sure your basement looks beautiful-- and stays that way. The Total Basement Finishing System uses only waterproof products when we remodel your basement. However, what you put in your basement after it's finished could still be damaged.. Basement water means big problems for your finished space. Flooding and humidity will lead to mold, rot, and odors in the space, which ruins the space as a comfortable living area. Even an occasional flood can leave lingering problems, and mold can begin to grow in as little as 24-48 hours. If your basement has ever flooded, you can be sure it's going to again. And even if your basement finishing products are waterproof, not everything you put in your finished basement will be. Install a vapor barrier on your walls and floors. A dry basement will be ready for finishing. Otherwise, you may be building a major problem that will emerge later on down the road. Call or e-mail us today to get a free basement finishing quote! Quick Tip: When you waterproof your basement, follow up with a basement dehumidifier. Choose one that's self-draining and energy efficient, and your home will be dry, odor-free, and much more comfortable. Our basement finishing system is designed with waterproof materials in mind. Because of this, we include a mold resistant and/or waterproof written warranty with each of our products. Even with a basement waterproofing system in place, your basement will easily flood if there's an issue with your plumbing. And with so much plumbing in your home, that kind of an issue is just be a matter of time. The Total Basement Finishing System, installed by Total Basement Finishing in the Massachusetts area, uses only inorganic materials in their basement finishing system. Each of their products includes a written warranty for mold and moisture damage resistance, and the walls and flooring are completely undamaged by water. Don't wait to get started on your basement finishing- call or contact us online today for a free basement finishing quote!